To easily identify elements in the Timeline or Xsheet view, you can change the colour of layers and columns. 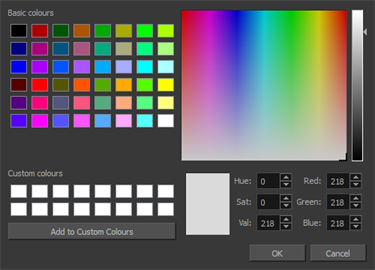 In the Select Colour dialog box, select a new colour for your layer. The layer’s background colour is updated. In a Drawing layer, exposed cells are the brighter, selected colour for easy identification. The corresponding column colour is also updated in the Xsheet. In the Timeline view, select the layers to reset. In the Timeline toolbar, click the Default Track Colour button (you may have to customize the toolbar to display it). In the Select Colour dialog box, select a new colour for your columns. The column’s colour is updated. The corresponding column colour is also updated. In the Xsheet view, select the columns to reset. Right-click on the column’s header and select Colour > Default Columns Colour.